“When I grow up I want to be a writer. I guess a lot of people my age say that and I also guess they’re told that fourteen isn’t old enough to know what you want to do with your life. That might be correct for some people, but not for me – I do know and it’s a really important deal for me. Rafi loves words, but she cannot speak them. A progressive mute she battles with a world that doesn’t understand her condition on a daily basis. Her broth Silas was the last person she spoke to, when she was 6, and he is the only person who really understands her… or was. Now he’s off in his own world and she’s telling his story, because he cannot tell it himself. I knew Laura Jarratt was an impressive author. I have known since I read Skin Deep two years ago that whatever she wrote will stay with me for a long time and this was very much true for her newest novel Louder Than Words. The story is incredible. The way you really get to understand Rafi and her condition and how it has changed the way she is and can be. The world is a scary place for her as it is, then you get Silas’ story and it becomes scarier. There are parts of the story which had me on the edge of my seat, hoping that the characters I love will be ok and that Rafi becomes who she wants to be. The characters really are what made this book. The main ones, Rafi, Silas and Josie, all have their own stuff going on and you really get to know. Rafi is battling with the way she is versus the way she wants to be and fighting her own demons. Josie is there at her side, being the most energetic, bubbly, smiley person I have ever met and because her personality is so upbeat it is infectious and you get up smiling just when she’s around too… Rafi couldn’t have had a better friend. Then Silas… I really liked Silas but he does become the definition of stupid, then again he thinks hes in love and love makes people do very stupid things. I loved them as characters and I loved their individual plot strands. The other characters were a bit less likeable… especially Lara, I hated her right from the start because she seemed so, I dunno, selfish, maybe? I just thought there was something about her and I didn’t like it so I struggled to like her. Her friends were interesting though and I loved their part of the story. 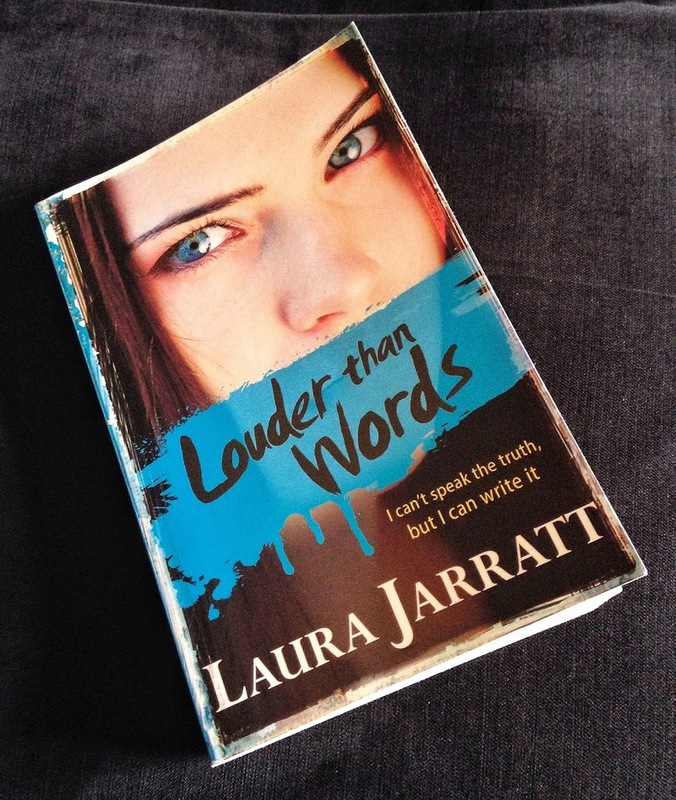 I think what I most love about Laura Jarratt is her ability with words, making them flow and making a 400 page book read as fast as a 200 page book with a lot more depth and emotion. I loved that each of the chapters in this book were separated out with quotes from famous people or quotes in general and I loved Rafi’s truth wall, thats an amazing idea! I took a lot away with me upon finishing this book, in the form of quotes and what words can mean and as an English language nerd I am happy about this book placing such an importance on words. There was a lot I loved about this book. It was raw and emotional and I fell in love with the characters. There pretty much wasn’t anything I’d change with the exception of Lara but I can’t go into that without spoiling parts of it so I wont. All I can say is that if you are looking for a gritty contemporary with a bit of a thrill you should definitely pick this up! Louder Than Words was published on June 5th by Electric Monkey. My copy was sent to me from the publisher in exchange for an honest review.